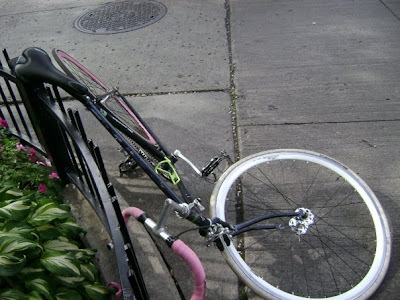 Free advice on how to fix your bicycle: Ride like you are invisible, you're not car proof! Ride like you are invisible, you're not car proof! The bike above, or what remains of it, belongs to a fellow volunteer at the Mile End community bike shop where I give some time. His name is Elton and he's a spirited young rider. This is his second crash this summer, that I know of anyways. Bike 0 Cars 2. Luckily he came out of it a bit shaken and bruised. The bike suffered a destroyed fork and wheel. No big deal, the kid is alive and well, that's all that matters. Then a few days ago my friend Riley, another volunteer at the shop, got rear ended by a drunk driver and ended up in the hospital(The driver was arrested and charged.). Thank God he came out of it without any major injuries. A bad case of road rash on his hip from what I heard. Now Elton's incident may have been partly due to his enthusiastic way of riding, but Riley's was totally unpredictable and those are the scary ones. I posted about safe riding a while ago and I want to use this post to again emphasize the importance of being aware, extremely aware, of your surroundings when you ride. Take for granted that most drivers don't have any consideration for you or your safety. A lot of them out there don't even know how to operate the heater in their car for crying out loud, but they are very good at multi-tasking with their make-up, cell phone and newspaper. That's until something on the road happens to break their concentration. Remember that even if you are in the right, the law of physics has always precedence over anything else, one ton of car will always win in a collision. Ride as if you were invisible, always. I don't know if it's because my kids are in the same age group as the guys and gals at the shop, but whenever I hear about one of them getting involved in an accident, I feel terrible. Just as if they were one of mine. I've chatted online with Riley today and he did tell me he was OK, but my mind won't be at peace until I see him in person. I only wish that this post will help someone avoid getting killed or seriously injured so that something positive came out of those incidents. Enthusiastic indeed! I do need to tone it down a bit on the road... I am actually quite happy that I came out of the crash the way I did because it will only help me to be even more careful when on the road. I did want to point out that it's still Car 1 Bike 0. The other one was a fall due to my silly bike tricks. Thanks for looking out for us, Gerry! Thanks for the clarification Elton.